Former President George HW Bush has apologized after an actress claimed he 'sexually assaulted' her while he was in his wheelchair. Heather Lind, 34, who starred in AMC's series 'Turn: Washington's Spies', made the allegations against the 93-year-old former president on Instagram in a lengthy post with accompanying photos. 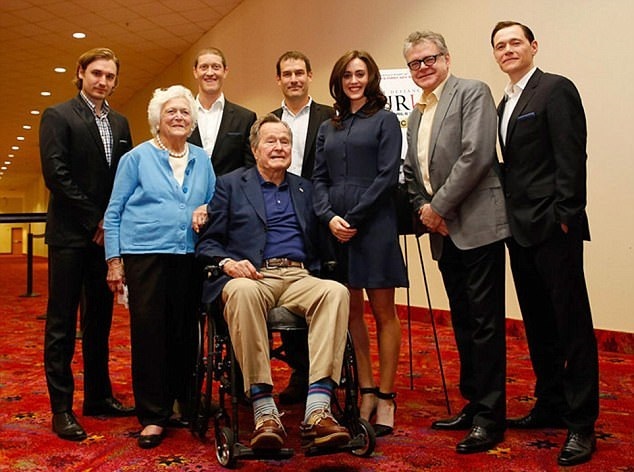 'When I got the chance to meet George H. W. Bush four years ago to promote a historical television show I was working on, he sexually assaulted me while I was posing for a similar photo. He didn't shake my hand. He touched me from behind from his wheelchair with his wife Barbara Bush by his side. He told me a dirty joke,' Lind alleges. Lind said in her since-deleted Instagram post it happened a second time: 'And then, all the while being photographed, touched me again. Barbara rolled her eyes as if to say ''not again''. His security guard told me I shouldn't have stood next to him for the photo. 'We were instructed to call him Mr. President. It seems to me a President's power is in his or her capacity to enact positive change, actually help people, and serve as a symbol of our democracy,' the lengthy post went on. 'He relinquished that power when he used it against me and, judging from the comments of those around him, countless other women before me,' Lind wrote. 'I can refuse to call him President, and call out other abuses of power when I see them,' she writes. Lind adds that she shared the allegations against Bush with people on her AMC series. 'My fellow cast-mates and producers helped me that day and continue to support me. I am grateful for the bravery of other women who have spoken up and written about their experiences,' she said. Lind concluded using the hashtag that has become a viral trend for people to share their allegations of sexual assault. People were divided on how to interpret Lind coming forward with her own #metoo story.